ESTATE at the MUCEM in Marseille, as part of the exhibition "Exil", on September 29th. ESTATE screened in Paris on 6th March, as part of the exhibition "Suspens" at LE BAL. THE EREMITES at the Berlinale, in the LOLA@BERLINALE sections, on 19th and 21st February. THE EREMITES in Rome, at the ARCIPELAGO FILM FESTIVAL, on 05th December. 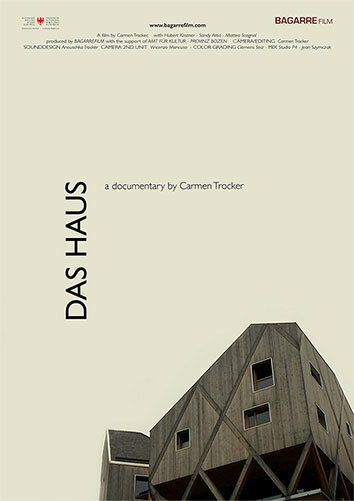 DAS HAUS in Italy, at the MILANO DESIGN FILM FESTIVAL , the 21st and 22nd October. THE EREMITES is one of the five nominated films for the EUROPEAN DISCOVERY - Prix FIPRESCI of the European Film Awards. 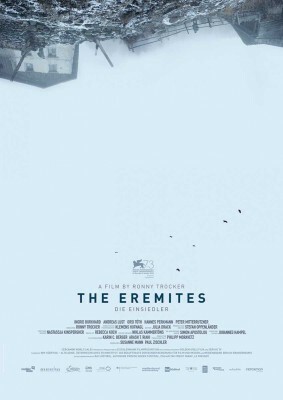 THE EREMITES out in Cinemas in Germany, from 12th October, and in Südtirol/Alto Adige (I) from 14th September. THE EREMITES wins the main prize at the FÜNFSEEN FILM FESTIVAL in Germany! THE EREMITES in Austria at the FILMFESTIVAL FREISTADT, from 23rd to 27th August and in Italy at FILM FESTIVAL DELLA LESSINA, from 19th to 27th August. ESTATE at the 17th NeMAF - SEOUL NEWMEDIA FILMFESTIVAL, in South Korea, from 17th to 25th August and in Indonesia, at the ARKIPEL - Experimental and Documentary Film Festival in Jakarta, from 18th to 26th August. THE EREMITES in Germany at the FÜNF SEEN FILMFESTIVAL, from 27th July to 5th August. Jury Price for ESTATE at the CHAMPS-ÉLYSÉES FILM FESTIVAL in Paris. THE EREMITES in Lima, Peru, at AL ESTE DE LIMA FILM FESTIVAL, from 7th to 17th June and in Košice, Slovakia, at the ART FILM FEST, from 16th to 24th June. ESTATE at the CHAMPS-ÉLYSÉE FILM FESTIVAL in Paris, from 15th to 22nd JUNE, at ROOFTOP FILM in New York on 10th June, in Cyprus, at the ANIMAFEST, from 24th to 28th June, at SHORTS - INTERNATIONAL FILM FESTIVAL in Trieste, Italy, from 1st to 8th July and in Jakarta, Indonesia at the ARKIPEL - DOCUMENTARY AND EXPERIMENTAL FILM FESTIVAL, from 18th to 26th August. DAS HAUS is part of the ARCHITECTURE FILMFESTIVAL FEST in London and will be screend on 10th June 2017. THE EREMITES at the IFFI - INTERNATIONALES FILMFESTIVAL INNSBRUCK on the 28th May 2017. 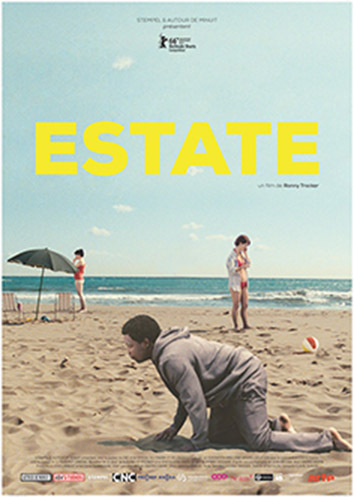 ESTATE in Australia, at the MELBOURNE HUMAN RIGHTS FILM AND ART FESTIVAL, from 4th to 18th May, and in Cagliari, Italy at SKEPTO INTERNATIONAL FILM FESTIVAL, from 10th to 13th May. THE EREMITES wins the Gran Jury Price in the New Directors Competition at the NASHVILLE FILM FESTIVAL. THE EREMITES back home, at the TRENTO FILM FESTIVAL, on the 2nd May 2017. Best visual Concept Award for ESTATE at the BIEFF - BUCHAREST INTERNATIONAL EXPERIMENTAL FILM FESTIVAL. Critiques Choise Award for THE EREMITES at the SAAS-FEE FILM FESTIVAL in Switzerland. Austrian Premiere of THE EREMITES at the DIAGONALE in Graz on 29th March, on the BOLZANO FILMFESTIVAL BOZEN in North Italy, from 05th to 9th April and on the SAAS-FEE FILM FESTIVAL (Ch) from 28th March to 2nd April. THE EREMITES in Prague, at the FEBIOFEST, from 23rd bis 31st March, at the 41st HONG KONG INTERNATIONAL FILM FESTIVAL, from 11th to 25th April and in the United States, at the NASHVILLE FILM FESTIVAL, from 20th to 29th April. ESTATE in Utrecht at the HOLLAND ANIMATION FILM FESTIVAL, from 22nd to 26th March, at the BIEFF-BUCHAREST INTERNATIONAL EXPERIMENTAL FILM FESTIVAL in Romania, from 28th March to 2nd April, in Nijmegen, Holland, at GO SHORTS, from 05th to 09th April and in Germany at the FILMFEST DRESDEN, from 04th to 09th April. Special Mention for ESTATE at the GLAS ANIMATION FILM FESTIVAL. THE EREMITES at the GLASGOW FILM FESTIVAL, on 18th and 22nd February. ESTATE wins the Prix Payot Price at the BLACK MOVIE FESTIVAL in Geneva, Switzerland. ESTATE in Finland, at the TAMPERE SHORT FILM FESTIVAL, from 8th to 13th March and in Bruxelles, at the ANIMA - BRUSSELS ANIMATION FILM FESTIVAL, from 24th to 5th March, and at the GLAS ANIMATION FESTIVAL in Berkley (US), from 2nd to 5th March. THE EREMITES in Rotterdam at the IFFR!!! Screenings in the Bright Future Section, on 29th and 30th January and on 2nd and 4th February. ESTATE at the FESTIVAL DU COURT MÉTRAGE CLERMONT-FERRAND, from 3rd to 11th February, in Prague at the PRAGUE SHORTS FESTIVAL, from 18th to 22nd January, and back in Geneva at the BLACK MOVIE FILM FESTIVAL, from 20th to 29th January. THE EREMITES will be screened at the MAX OPHÜLS FILMFESTIVAL in Saarbrücken (GER), as part of the MOP-Watchlist Section, on 27th and 28th January and in Italy, at BRESCIA FILMWINTER, on 19th January. MAGRITTE DU CINEMA in Belgium: ESTATE is nominated for Best Animation Film! ESTATE in Paris: CARREFOUR DU CINEMA D'ANIMATION, at the Forum des Image, 10th December, 16:30. THE EREMITES in Estonia, at the PÖFF - TALLINN BLACK NIGHTS FILM FESTIVAL, from 11th to 27th November, and in Istanbul, at the BOSPHORUS FILM FESTIVAL, from 10th to 18th November. Special Jury Mention for ESTATE at the MEDFILM FESTIVAL in Rome and the RICA WISSEMBOURG. THE EREMITES in Germany again, at the BRAUNSCHWEIG FILMFESTIVAL from 7th to 13th November, at the KINOFEST LÜNEN, 10th to 13th November and in Greece, at the THESSALONIKI INTERNATIONAL FILM FESTIVAL, from 3rd to 13th November. ESTATE in Spain, at the FILMETS-BADALONA FILM FESTIVAL, from 21st to 30th October, in Switzerland at the INTERNATIONALE KURZFILMTAGE WINTERTHUR, from 8th to 13th November, in Geneva at TOUS ECRANS, from 4th to 12th November, in the Czech Republic at the renowned JIHLAVA INTERNATIONAL DOCUMENTARY FESTIVAL, from 25th to 30th October, in São Paulo, Brasil at ANIMA MUNDI, from 2nd to 6th November, in Yerevan, Armenia, at the REANIMANIA FILM FESTIVAL, from in France at the FESTIVAL DU GRAIN A DEMOUDRE, from 19th to 27th November and at the RICA WISSEMBOURG, from 14th to 22nd November, in Rome, Italy at the MEDFILM FESTIVAL, from 4th to 12th November. DAS HAUS at the ART DOC FESTIVAL in Rome (I), on 18th October 2016. ESTATE to be broadcasted on ARTE the 21/10/2016 at 01:20h, in Spain on CANAL+ Xtra the 21/10/2016 at 23:45 and in Belgium on RTBF, the 25/10/2016 at 23:15h. - 12th ZURICH FILM FESTIVAL (CH) from 22nd September to 3rd October. - FILMFEST HAMBURG (GER) from 29th to 8th October. - CPH PIX in Copenhagen, from 27th October to 9th November. - MILANO FILM FESTIVAL, from 8th to 18th September. - SEQUENCE COURT-METRAGE in Toulouse (F), from 6th to 15th September. - OTTAWA INT. ANIMATION FESTIVAL (Ca) from 21st 26th September. - RENCONTRES AUDIOVISUELLES in Lille (F), from 20th to 25th September. - 17th FESTIVAL DE PONTAULD-COMBAULT (F) from 7th to 14th October. - 2ANNAS FESTIVAL in Riga-Latvia, from 27th September to 2nd October. - THESS INTERNATIONAL SHORT FILM FESTIVAL in Thessaloniki, from 7th to 13th October. - KLICK! AMSTERDAM ANIMNATION FILM FESTIVAL from 25th to 30th October. - 52nd CHICAGO INTERNATIONAL FILM FESTIVAL, from 13th to 27th October. - NEW CHITOSE AIRPORT FESTIVAL in Japan, from 3rd to 6th November. DIE EINSIEDLER // THE EREMITES World Premiere in the Orizzonti Competition at the 73rd MOSTRA INTERNAZIONALE D'ARTE CINEMATOGRAFICA, 02.09.2106!! and the ANIMANIMA FILM FESTIVAL (7th to 11th September). "Prix Coup de Coeur RTBF" for ESTATE at LE COURT EN DIT LONG in Paris. DAS HAUS by Carmen Trocker will have its Premiere at the TRENTO FILM FESTIVAL, in the "Orizzonti vicini" Section, the 2nd may 2016 !!! STUTTGART FESTIVAL OF ANIMATED FILM - ITFS (26th April to 1st may), in Belgium, at the BRUXELLES SHORT FILM FESTIVAL (28th april to 8th may) and at the COLCOA - FRENCH FILM FESTIVAL in Los Angeles (Usa) from 18th to 26th april. ESTATE at the 40th HONG KONG INTERNATIONAL FILM FESTIVAL, from 21st march to 4th April 2016. The video-installation of ESTATE will be exposed in Paris at the CENTQATRE-PARIS from 13.02 to 30.04 as part of the collective exhibition MATERIALITÈ DE L'INVISIBLE. ESTATE world premiere at the 66th BERLINALE, in the International Shorts Competition. From 11th to 21st February 2016, Berlin, Germany. GLI IMMACOLATI at the GLOBALE MITTELHESSEN, Germany, from 22nd to 31st January 2016. GLI IMMACOLATI in Belo Horizonte, Brasil, at the 13th MUMIA - INTERNATIONAL UNDERGROUND ANIMATION FESTIVAL, from 1st to 18th December 2015. GLI IMMACOLATI in Montreuil, for LA NOUVELLE VAGUE NUMERIQUE, Maison Populaire de Montreuil, 3rd December 2015. GLI IMMACOLATI back at L'ALTERNATIVA - FESTIVAL DE CINEMA INDEPENDENT in Barcelona /Spain, for a special programme about "Fortress Europe". 18th and 20th November 2015. GLI IMMACOLATI in Japan, at the NEW CHITOSE AIRPORT ANIMATION FILM FESTIVAL, from 31st October to 3rd November 2015. GLI IMMACOLATI at the 28th MFF -MONTENEGRO FIM FESTIVAL in Herceg Novi (ME) from 1st to 7th August 2015. GLI IMMACOLATI in Plymouth (UK), at the RESPECT FESTIVAL, in film program curated by FOTONOW. June 2015. GLI IMMACOLATI at the BACKUP FESTIVAL in Weimar (Germany). From 27th to 31st May. GLI IMMACOLATI at the FIDÈ - FESTIVAL INTERNATIONAL DU DOCUMENTAIRE ETUDIANT in Saint-Ouen, France, from 8th to 11th April, and in Curitiba, Brasil, from 24th to 26th April. GLI IMMACOLATI in Toronto at the IMAGES FESTIVAL, from 9th to 18th April. GLI IMMACOLATI in Greece at the 10th ATHENS ANIMATION FILM FESTIVAL, from 26th March to 1stApril 2015. GLI IMMACOLATI at Marseille (F) at "LATCHO DIVANO - Festival des cultures tsiganes", the 26th March, 20h, Cinéma des Variétiés. GLI IMMACOLATI at the FIFA - FESTIVAL INTERNATIONAL SUR L'ART, in Montreal, as part of a "Le Fresnoy " Showcase. (22.March). 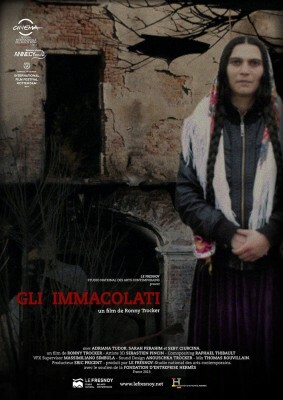 GLI IMMACOLATI at the CLEVELAND INTERNATIONAL FILM FESTIVAL (Usa), from 18th to 29th March. GLI IMMACOLATI in Toulouse at TRAVERSE VIDEO from 17th to 31st March. GLI IMMACOLATI back in Tampere (Fi) for the special program "Reality Check" at the TAMPERE INTERNATIONAL SHORT FILM FESTIVAL (from 4th to 8th March. Among other films from "Le Fresnoy", GLI IMMACOLATI will be part of the the exhibition "Le Fresnoy - Mémoire de l'imagination" at the BnF (Bibliothèque national de France) in Paris, from 8th mars to 11th april 2015. GLI IMMACOLATI at 24th FLICKERFEST in Australia, Bondy Beach/Sydney, from 9th to 24th January. GLI IMMACOLATI broadcasted in The Netherlands on the Documentary Channel NPO DOC, on 04th January at 17h. GRENZLAND - TERRA DI CONFINE and GLI IMMACOLATI first time in Bruxelles (B) at NADINE - Laboratory for contemporary arts, 9th December, 20h. - FESTIVAL NATIONAL DU FILM D'ANIMATION in Bruz (France) from 8th to 14th December. - BOGOSHORTS Film Festival in Bogotá (Colombia) from 2nd to 8th December. - EFEBOCORTO in Castelvetrano (Italy), from 9th to 11th December. GLI IMMACOLATI to be broadcasted in Germany: WDR on 22 november at 23:30 and at ARD - EINSFESTIVAL on 28 november at 23:15, as part of the award-winning films at Kurzundschön. - FENÊTRES SUR COURT in Dijon (France) from 1st to 8th November. - AESTHETICA SHORT FILM FESTIVAL in York (UK) from 6th to 9th November. - INSTANT VIDEO in Marseille (France) from7th to 11th November. - KASSLER DOKFEST (Germany) from 11th to 16th November. - INTERFILM Short Film Festival in Berlin (Germany) from 11th to 16th November. - FESTIVAL EUROPEEN DU FILM COURT in Brest (France) from 11th to 16th November. - FESTIVAL TOUS ÉCRAN a Geneva (CH) from 6th to 13th November. - RIDM Rencontres Internationales du Documentaires du Montréal (Canada) from 12th to 23rd November. - LINEA D'OMBRA in Salerno (Italy) from 13th to 15th November. - SLEEPWALKERS - Int. Short Film Festival in Tallinn (Estonia) from 18th to 22nd november. - BRADFORD ANIMATION FILM FESTIVAL (Uk) from 17th to 22nd November. - L'ALTERNATIVA Festival de Cinema Independente Barcelona (Spain) from 17th to 23rd November. - COURT C'EST COURT, Avignon (France from 20th to 23rd November. - RICA in Wissembourg from 17th to 25th November. - PARENTESI CINEMA in Bergamo (Italy) from 27th to 29th November. - BOGAZICI Bosphorus International Film Festival in Istanbul (Turkey) from 14th to 28th November. - DIGITAL MARRAKESH (Marocco) from 28th to 30th November. - SZCZECIN EUROPEAN FILM FESTIVAL in Poland, from 29th September to 6th October. - SEDICICORTO in Forlí (Italy) from 3rd to 11th October. - ANIM'EST Int. Animation Film Festival in Bucharest (Romania) from 3rd to 12 October. - CHICAGO INTERNATIONAL FILM FESTIVAL (Usa) from 9th to 23rd October. - VIEW CONFERENCE in Torino (Italy) from 13th to 17th October. - 2ANNAS Riga International Film Festival in Latvia from 17th to 26th October. - KAOHSIUNG FILM FESTIVAL in Taiwan from 24th October to 9th November. "Prix Jeune Talent Arts Numeriques" - SCAM/104/ARTE for GLI IMMACOLATI, now available for online streaming in Germany and France on ARTE Creative. - SHORTS-SHORTS FILMFESTIVAL MEXICO (DF) from 4th to 10th September. - FORMATCOURT in Paris, at Studio des Ursulines, 11th September, at 21h. - FRESH FILM FESTIVAL in Prague (CZ), from 17th to 21st --September. - ARKIPEL - Int. Doc. and Experimental Festival - Jakarta (Indonesia) from 11th to 21st September. - NAOUSSA Int. Film Festival - DIGITAL SHORTS, in Naoussa (Greece) from 24th to 28th September. GLI IMMACOLATI wins the "iGONG New Artist Award" at the SEOUL INTERNATIONAL NEW MEDIA FESTIVAL, in South Korea. First time in Germany: GLI IMMACOLATI in Marburg at the OPEN EYES FILMFEST, from 17th to 20th July. GLI IMMACOLATI at PSAROLOCO in Athens, Greece. GLI IMMACOLATI at the GENOVA FILM FESTIVAL (Italy) from 30th June to 6th July. GLI IMMACOLATI at the EAST END FILM FESTIVAL in London (Uk) from 13th to 25th June. GLI IMMACOLATI at the ICFF - Italian Contemporary Film Festival, in Toronto, Canada, from 12th to 20th June. GLI IMMACOLATI in Spain, at the HUESCA INTERNATIONAL FILM FESTIVAL, from 19th to 23rd June. GLI IMMACOLATI at the FESTIVAL DE CONTIS, from 19th to 23rd June. GLI IMMACOLATI in Pantin, France, in the Panorama section of CÔTÉ COURT , from 11th to 21st June. "Best Student Documentary Short - 2nd Place" for GLI IMMACOLATI at the SHORT FEST in Palm Springs. GLI IMMACOLATI at the ANNECY INTERNATIONAL ANIMATION FILM FESTIVAL in France, from 9th May to 14th June. GLI IMMACOLATI in Turkey, at the DOKUMENTARIST FIM FESTIVAL in Istanbul, from 7th to 12th June. CORTO IN BRA, GLI IMMACOLATI in Bra, Italy, from 2nd to 8th June. GLI IMMACOLATI in Makarska, Croatia, at the DOKUMA FILM FESTIVAL, from 29th May to 1st June. GLI IMMACOLATI at the RIVER FILM FESTIVAL in Padova, Italy, from 29th May to 06th June. GLI IMMACOLATI got a "Special Mention" from the Jury at the KIEV INTERNATIONAL SHORT FILM FESTIVAL, 21st to 25th May in Ukraine. GLI IMMACOLATI at the TRENTO FILM FESTIVAL, in the "Orizzonti vicini" Section. From 24th April to 7th May, in Trento (Italy). GLI IMMACOLATI at the TRIPOLI FILM FESTIVAL in Lebanon, from 24th to 29th April. GLI IMMACOLATI in South Korea, at the BUSAN INTERNATIONAL SHORT FILM FESTIVAL, from 25th to 29th April. GRENZLAND - TERRA DI CONFINE will be screened in Vienna, Thursday 10th april, at 19h, at the Weltmuseum Wien, in the occasion of the ETHNOCINECA FILMCLUB. GLI IMMACOLATI in France at the CINECLASS Festival, from 7th to 11th April. First time on the Balkans, GLI IMMACOLATI will be screened at the BELGRADE SHORT AND DOCUMENTARY FILM FESTIVAL in Serbia, from 2nd to 6th April 2014. É tudo verdade...GLI IMMACOLATI in Brasil, at the INTERNATIONAL DOCUMENTARY FESTIVAL - IT'S ALL TRUE - É TUDO VERDADE, in São Paulo and Rio de Janeiro, from 5th to 9th April 2014. GLI IMMACOLATI back in Clermont-Ferrand for VIDEOFORMES - Festival International d'Arts Numériques, on 20.03.2014. GLI IMMACOLATI screened on the occasion of "Anthropologie numerique" at LE CUBE - a place for Digital Art in Paris, on 19.03.2014. GLI IMMACOLATI at the CA'FOSCARI SHORT FILM FESTIVAL in Venice, from 19 to 22 march, 2014. Scandinavian premiere for GLI IMMACOLATI in Finland, at the TAMPERE INTERNATIONAL FILM FESTIVAL, from 05 to 09 march, 2014. 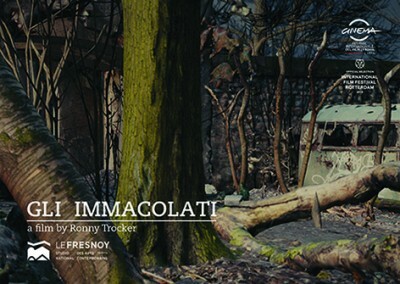 GLI IMMACOLATI in Glasgow, at the GLASGOW FILM FESTIVAL, from 13 to 15 february 2014. GLI IMMACOLATI at the 36th CLERMONT-FERRAND INTERNATIONAL SHORT FILM FESTIVAL, in French Competitiom, from 01 to 08 february 2014. GLI IMMACOLATI in Rotterdam, at the INTERNATIONAL FILM FESTIVAL ROTTERDAM, the 26, 27 and 31. January 2014. French premiere for GLI IMMACOLATI in Poitiers, at the RENCONTRES INTERNATIONAL HENRI LANGLOIS, from 29th to 8th December. EISZEIT at the ARCIPELAGO-Festival Internazionale di cortometraggi e Nuove Immagini in Rome (Italy), from 2 to 6th December 2013. GLI IMMACOLATI world premiere in Rome, at the FESTIVAL INTERNAZIONALE DEL FILM DI ROMA. CinemaXXI Competition, the 11.11.2013. GRENZLAND - TERRA DI CONFINE at IL GRANDE SENTIERO, November 2013 in Bergamo (Italy). GRENZLAND - TERRA DI CONFINE at BERG-BUCH-BRIG, 08.11.2013 in Brig (Switzerland). 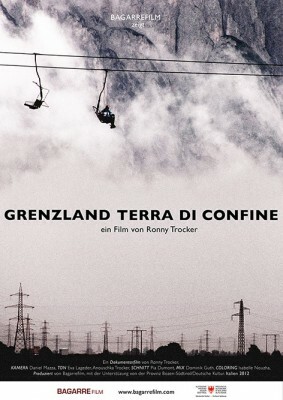 GRENZLAND - TERRA DI CONFINE at TRENTO FILM FESTIVAL, 28.04.2013 in Trento (Italy). GRENZLAND - TERRA DI CONFINE at GRENZLAND FILMTAGE SELB, 05.04.2013, in Selb (Germany). GRENZLAND - TERRA DI CONFINE at SCHIKANEDER KINO, Vienna (Austria). 13.03.2013 at 19:00. EISZEIT at FESTIVAL TOUS COURTS in Aix-en-Provence (France), 05.12.2012.